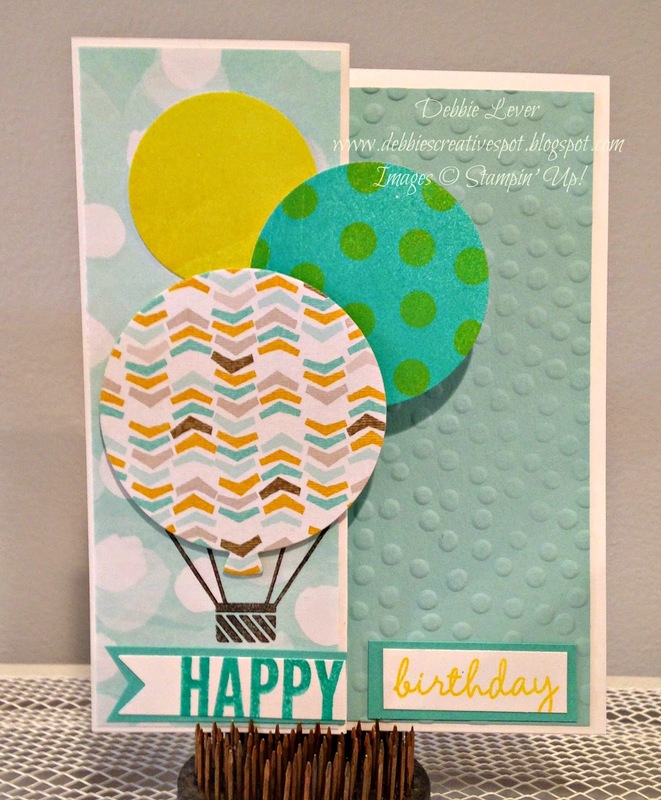 Debbie's Creative Spot: More Fun With Celebrate Today Stamp Set and Chalk Inks! More Fun With Celebrate Today Stamp Set and Chalk Inks! My card design was inspired by a card I saw on Pinterest. Isn't it adorable? 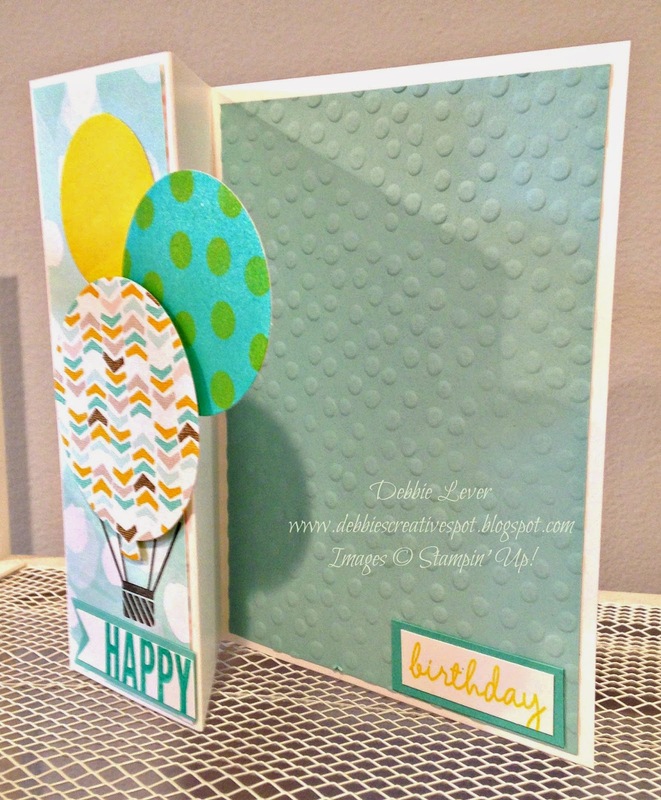 I am having such a fun time with the Celebrate Today stamp set and coordinating Balloon Framelits. I've said it many times before, Stampin' Up! rocks with coordinating products! My card is a Z fold. I started with a regular card base size, 5-1/2 x 4-1/4 and folded the front flap back on itself in half. It makes for an interesting, fun card. I embossed a piece of Pool Party cardstock using the Decorative Dots embossing folder and adhered that on the inside of the card. A piece of the Best Year Ever Designer Series Paper was adhered to the front flap. It gives the illusion of clouds. By the way, this paper pack is a FREE Sale-A-Bration choice. I can't get enough of this paper. I used it to cut out my balloon hanging from the basket as well. 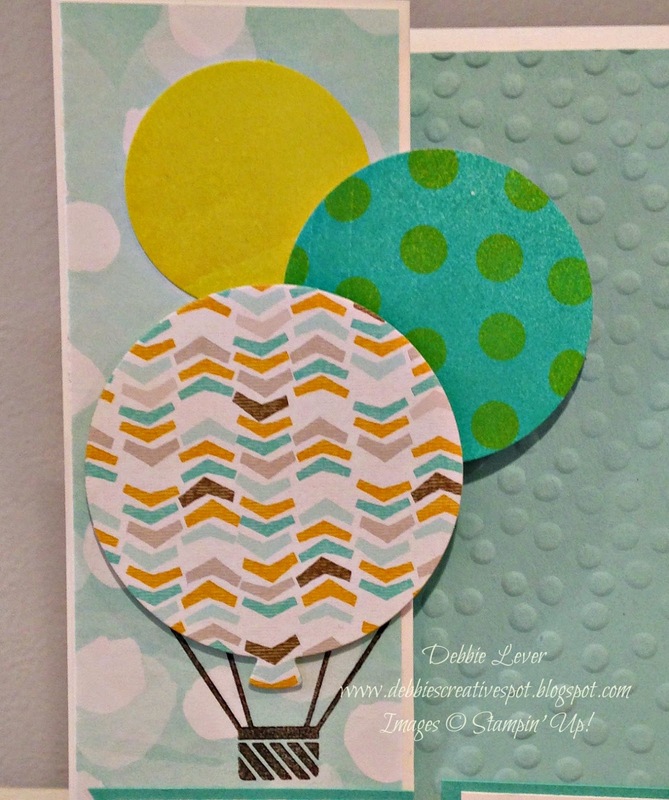 To make the other balloons, I used the solid balloon image in the stamp set and stamped on a piece of Whisper White cardstock using Colorbox Chalk Ink ( in the Occasions Catalog ) Aquamarine and Yellow Citrus. This ink is so vibrant when stamped on the Whisper White! The polka dots on the one balloon is another stamp in the set stamped over the solid image. I used my Circle Framelits to cut the balloons out because I wanted them smaller. This card is going to a special little someone who is turning 1 next month. Maybe I need to add a number one to one of the balloons. Hmmm......what do you think? My Stampin' Up! Supply List - click on images for details and easy online shopping.